If you're into its style, the Philips Hue Wellner lamp can be a decent way to way to expand an existing Hue setup, but it's not much good to people who haven't invested — or plan to invest — in the ecosystem. As a rule, smart bulbs are usually sold on their own or in kits with other bulbs, sometimes as part of a package with a control hub. Manufacturers presume that you already have a lamp or other fixture to screw them into. Philips has a huge lighting division, though, and it makes sense that they would be able to sell you both products at the same time. Enter the Hue Wellner, nominally a one-stop solution for smart lighting. Included is a lamp and a Hue White Ambiance bulb. People familiar with Hue will notice a major omission though: the Hue Bridge. While you can theoretically pair the White Ambiance with a Hue dimmer switch and leave things be, that'd be crazy — you might as well have bought a conventional lamp. Essential smarthome functions like timers, remote access, and integration with Apple HomeKit require the Bridge, which costs $52 from Amazon.com. If you do have a Bridge, the Wellner becomes palatable. 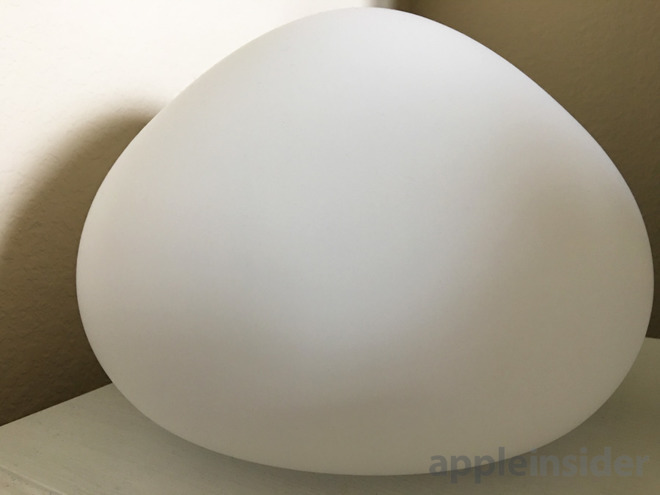 Via the Hue iPhone and iPad app, or Apple's own Home app, you can assign the lamp to a room and weave it into elaborate scenes and automations. Some functions are limited to the Hue app, such as gradual "Wake up" and "Go to sleep" routines, or modeling a lighting scene on colors pulled from an image in your camera roll. 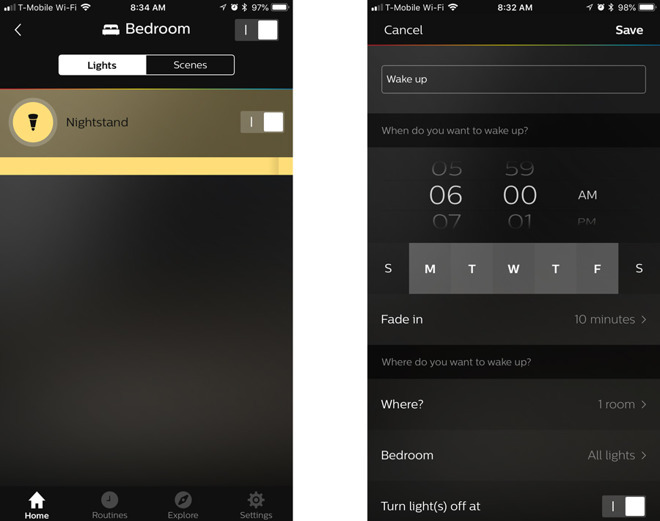 In fact reviewing the Wellner reminded us of how limited the iOS Home app is. 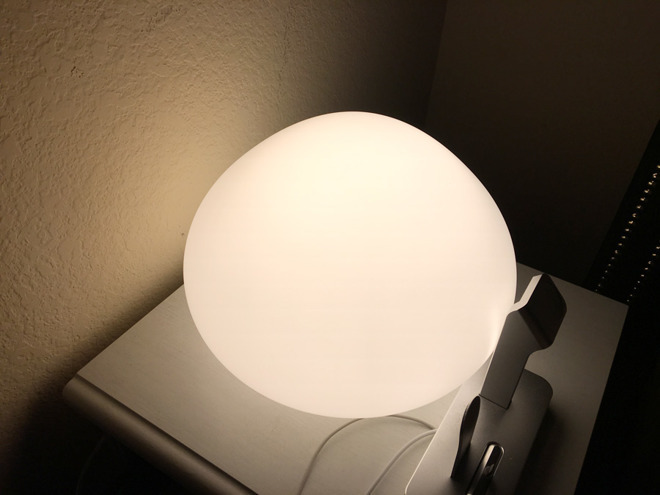 Nothing like "Wake up" is possible in Apple's software, since lights are either on or off in scenes and automations, even if you can pick the color and brightness for individual bulbs. That's a shame, because I enjoyed being woken up gently. Some people may be disappointed that Philips doesn't include a full-color bulb, but the White Ambiance is probably more than enough for most people. It delivers cool and warm color temperatures along the white spectrum, with an emphasis on matching the time of day. At a maximum 800 lumens, there are brighter LED options available, and the bulb's power is further diminished by the Wellner's frosted glass. That said I found it to be sufficiently bright for settings like a desktop or bedroom, with the frosting creating a pleasing soft diffusion. There are a few cautions to make about the lamp's design. First be warned that it's all glass, lacking even some sort of grip on the base to keep it from sliding around. Avoid placing it anywhere there's a risk of it tumbling to the ground, or you may have to sweep up an expensive mess. Also, its visual appeal isn't universal. I was a fan, but my wife wasn't, and even if everyone is onboard it may not match your decor. It works well with ultra-modern homes but can clash with rustic furniture. Lastly it has a huge footprint, which can easily dominate nightstands or small desks. Picture a partly deflated basketball and you've got the right dimensions. The Wellner is a potentially attractive lamp, but inherently crippled without a Bridge. Adding that can push the price to as much as $160, which isn't worth it unless you absolutely insist on the lamp's aesthetic. I'd only seriously consider the Wellner if you've got a Bridge in tow and want both its looks and White Ambiance effects. Otherwise you're better off buying a Hue Starter Kit and pairing it with your old lamps, and/or shopping for cheaper, neutral lamp designs. The Philips Hue Wellner is currently on sale for $87.29 at Amazon.com, a discount of 13 percent off MSRP. Best Buy also has the smart table lamp for $90.99 with free shipping or in-store pickup.